I used the trees from the PTI Tinsel and Tags Market Kit and half of a sentiment from PTI's Side by Side Sentiments. I love this card Ardyth ..... the bright colours make a refreshing change from the traditional reds and greens. Not sure about the Ranger Inks. Love the sweet little snow at the bottom of the trees Ardyth. I really love your card, Ardyth! 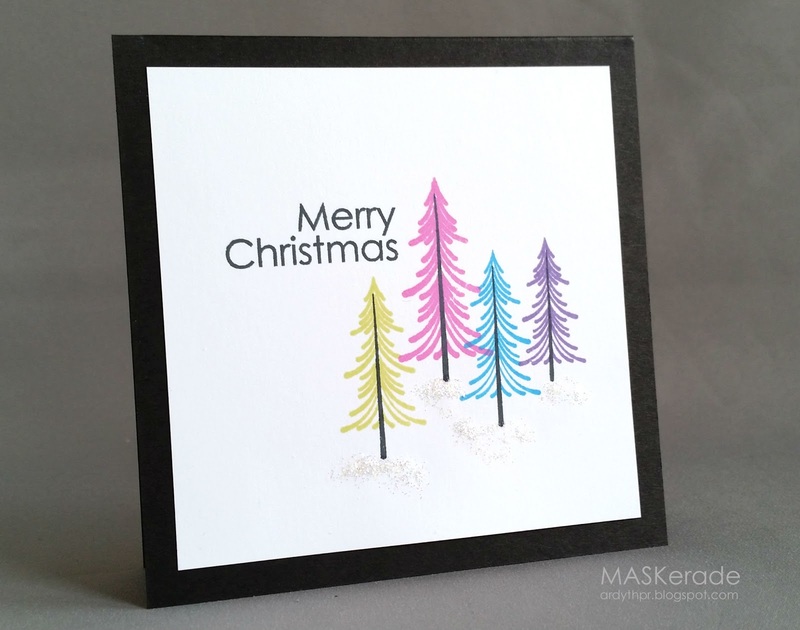 It is great to see a christmas card in non-traditional colours. I love love love this Ardyth. Those trees make me so happy. I love this card Ardyth! Such a cute way to use those trees! ...how in the heck did I miss this pink ink? I love the shade AND I LOVE this card! The bits of black in the sentiment, tree trunks and base REALLY enhance the vibrancy of the inked trees! Lovely!!!! Wonderful colors!!! So envious of your getaway!! Would be so awesome!!! Ooh, love the funky colours of those trees! What a fabulous grouping of rainbow trees. So festive. what a fantastic card, wonderful! Doesn;t matter who started with it; it is a beautiful and fun card! What a beautiful card...what I really love is how you used the sentiment, love that Merry Christmas. I finally posted my card today. I really love that your's is square, really makes your trees stand out. And I do have to agree with Bev, just as beautiful on your blog as it was in person. I really love Xmas cards that aren't in the tradtional colours. Those tree's are so soft and pretty, love that stamp. Definitely 'pinning' this one! Warning - Adirondack is so addicting. Sometimes finicky to stamp with clear stamps but the colors are oh-so-rewarding.